Hai Wai Tien is located on the same block as Thien Thien and Pizza Hut Gadong – next to Booker International Bookstore or directly opposite Pondok Sari Wangi. It’s one of the best place to have Sau Rou (roasted crispy pork belly) and Char Siew. Their Sau Pai Kut (roasted spare ribs) are delicious as well! This restaurant gives Golden Leaf Restaurant (another favourite place of mine for roasted pork) a big challenge! It’s a pretty spacious kopitiam style restaurant but comfortably air conditioned. 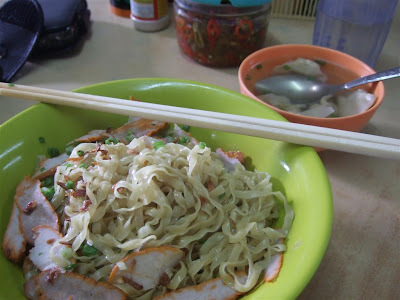 Always remember to ask for “Chong Yiu” which is a blend of green onions, ginger and oil. This goes very well with the roasted meats! Crispy Kailan (you order Kailan chow kailan) – Deep fried kailan leaves till crispy and sprinkled with sugar. A way to get kids to eat some veggies! Here’s the reason we decided to lunch here – friend raved about the crispy pork intestines here so here I am. What did I think of it? Delicious! Something a food lover should taste. Crispy, great chewy texture inside and tastes good! Dong Puo Rou (braised pork belly) – Needs no introduction – succulent and melt in your mouth goodness!! RAWR!! Served with Steamed Buns! Hmm…..
UPDATE: 22/11/2012 They now have OCEAN QUARRY's KOLOMEE served in this restaurant. KoloMee plus dim sum at the same time? Oh yes! 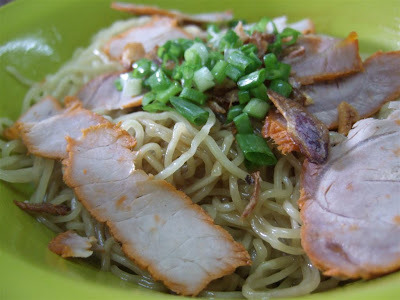 Click here for the link on the best kolomee in Brunei Post!